Lighting technology is surprisingly exciting these days, and the ‘Hang It On the Wall‘ lighting fixture, from designer Harry Thaler, is a lighthearted celebration of this evolving industry. The lamp’s design is a response to the phasing out of the iconic Edison light bulb. 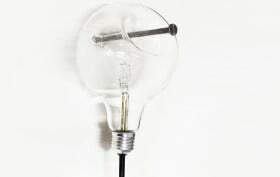 While the pear-shaped form of the original bulb is still intact, the lamp’s glass fixture has been distorted to represent how things are changing.